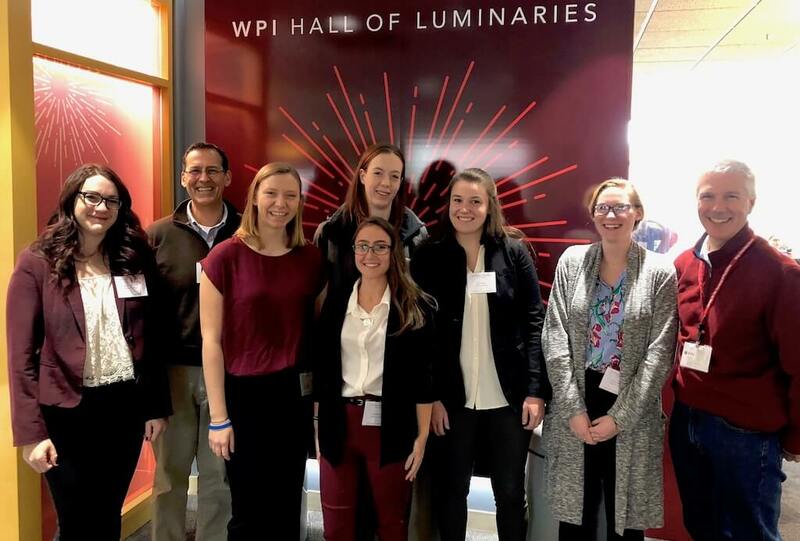 Six Nichols College students and their professors attended the Nov. 10 New England Psychological Association annual meeting at Worcester Polytechnic Institute. The meeting included educational sessions on a range of psychology-related topics as well as several poster sessions. Pictured, from left to right: Christina Demalia, ’20; Professor Brian McCoy; Jessica Warner, ’21; Nicole Murray, ‘21 (in the back); Shannon Sly, ’21 (front); Beth Laing, ’21; Dakota Mullen, ’20; Professor Tom Davis. Academic Affairs, Events, Faculty, Research, Students academics, Faculty, psychology, research, Students. permalink.